Boston DSA conducts its convention according to Robert’s Rules of Order, Newly Revised (RONR). 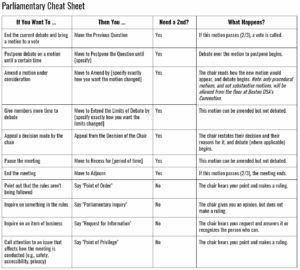 RONR is a widely used series of parliamentary procedures that ensure meetings are conducted fairly, transparently, and without denying access to viewpoints in the minority. Any exceptions to the rules of order in RONR are specified in the Convention Rules. Business is conducted at meetings by (1) following the agenda and (2) making motions. A motion is a means of putting business before the membership for consideration.